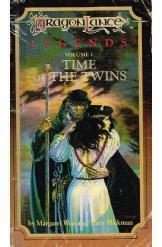 DragonLance: Time of the Twins by Margaret Weis and Tracey Hickman, Sci Fi. Book is in good condition, all pages intact. Crysania is a cleric of good, but drawn to Raistlin, a powerful archmage who intends for darkness to return. His twin brother Caramon needs to understand himself before he can redeem his brother. Together with Tasselhoff they jouney to the days before the Cataclysm.